There are many advantages of rubber as a material, but most are associated with its inherent elasticity. Unlike most materials, rubber will very quickly recover its original form, even after large deformations. Under modest pressure it will also mould itself closely to harder and less than perfectly even surfaces, especially metals. Together with its resistance to wear, these properties make it ideal for a wide variety of sealing applications. Chemically speaking, rubber is an elastic material made up of long chain molecules known as polymers. 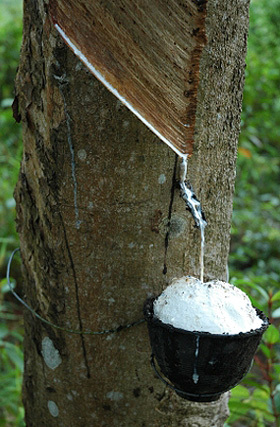 Such polymers occur naturally in the sap of Hevea and Ficus trees, but for industrial purposes are now more often synthesised from a variety of other chemical compounds having short chain molecules, or monomers. In their raw form polymers generally lack most of the properties required in finished rubber products. It is not until these polymers are mixed together with other materials, or compounded, that these properties are achieved. The basic raw material, this being the polymer itself. The Reinforcing – most commonly carbon, or in the case of coloured compounds silica. The reinforcing gives the compound its mechanical strength, and determines many of its characteristics. Accelerators, or chemical catalysts that promote the cross-linking of the long chain molecules within the compound. It is this cross-linking which gives rise to the compound’s ability to recover its initial form. Additives, in the form of small quantities of oils, fatty acids and waxes. Additives enhance the performance of a compound in downstream manufacture, depending on its end use.